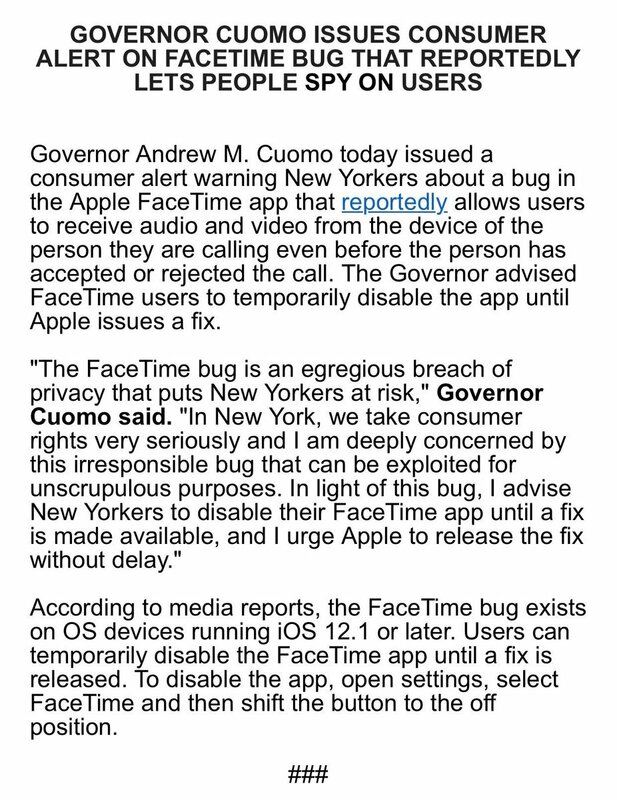 "The FaceTime bug is an egregios breach of privacy," Cuomo continued, "I am deeply concerned by this irresponsible bug that can be exploited for unscrupulous purposes." This comes after a recently discovered bug with Apple's FaceTime feature is raising privacy concerns. Multiple tech outlets reported Monday on a bug that allows iPhone users to listen in on the person they're calling via FaceTime, without the recipient accepting the call. Here's how it works: an iPhone user calls someone else on FaceTime, taps Add Person and adds their own phone number. Without the recipient answering the phone, audio from the other user's phone is then streamed to the caller. If the recipient hits the phone's power button, thinking they've declined the call, another curious bug kicks in. The recipient's audio cuts out, but the caller can suddenly monitor their camera. In a statement to ABC News, a spokesperson for Apple said, "We're aware of this issue and we have identified a fix that will be released in a software update later this week." If you're running iOS 12.1 or later and want to turn off Group FaceTime, go to Settings on your iPhone, tap Facetime, and toggle off the app.